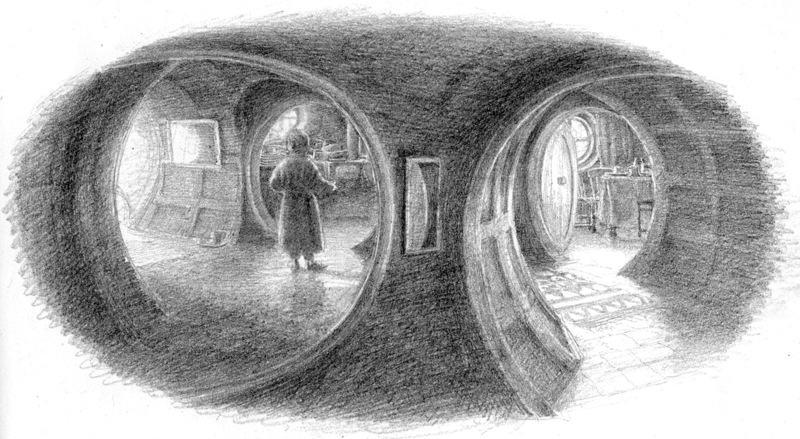 Continuing on with the group read of The Hobbit, where we leave the comfort of home and our adventure really beings. Were it not for the wreckage of breakfast (odd, considering they cleaned up dinner the night before), the events of Chapter 1 could have been naught but a dream for Bilbo. But for better or for worse, a band of dwarfs shepherded by a a wizard descended upon Bilbo's home and invited him to join their quest to reclaim their long lost home and wealth. But if there's one thing wizards are good for, it is creating and banishing illusion. A quick check-in by Gandalf later, we see Bilbo racing to meet the waiting dwarfs, a bundle of confusion, anxiety, and excitement. Once he meets up with the dwarfs, he is a part of the party but as misfitting as the garments he borrows. Our band of adventurers actually travels for quite some time before any incident of note occurs, Tolkien neatly indicates their journey so far with a sentence or two, the moves on to traveling in the rain, noticing the lack of Gandalf, and ultimately the whole messy business with the trolls. I've always read this book as if none of the band had any strong martial experience. We know that Thorin was but an "adventurous lad" when the dragon came when he shares the quest's backstory in Chapter One. They had the dreams of their fathers' wealth and power, but they have all been living as refugees & itinerant workers for most of a lifetime. "After that we went away, and we have had to earn our livings as best we could up and down the lands, often enough sinking as low as blacksmith-work or even coalmining." In fact, Fili and Kili need to be filled in on the exact situation just as much as Bilbo, and Gandalf speaks of failing to find a Hero or Warrior for the type of assault Thorin outlined, instead settling on the aforementioned Bilbo as a Burglar. The encounter with the trolls reinforces that these dwarfs are not all mighty warriors or even seasoned guards. They're the tattered remains of a displaced tribe seeking to regain their grandfathers' land and glory. So when it comes to investigate a mysterious campfire in the woods (or planning to infiltrate the dragon's lair), it's not their own beards they risk, but the toe-hairs of one contracted Burglar, someone who may even be considered disposable to at least Thorin. Their plan isn't even thought out, they give Bilbo instructions that they assume he understands, and shove him along his way. The fact that they'd respond to their scout failing to return or signal by wandering in illustrates that these dwarfs are really not used to thinking in terms of ambushes and attacks. This all contrasts quite strongly with how the dwarfs are presented in Jackson's movie, where he takes these already very proud characters, gives them even more pride, active fighting roles against the invading Smaug, and an still living nemesis from a long-ago war. All this seems to to frame the dwarfs as far more heroic and noble than in the source material (and to stretch out the story even more). Yes, in the intervening years some of the party did fight within wars to some acclaim, they have not primarily lived a martial life. I find the whole troll scene a wonderful and witty scene. There is danger, but there is comedy as well. And while the trolls are certainly a dangerous threat, they do not fit into any archtype of dastardly villain. 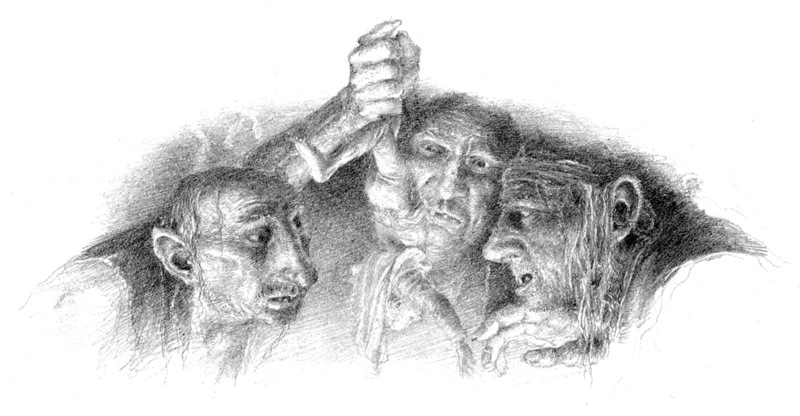 They are simply trolls as trolls, bad-mannered eaters of flesh, and creatures of the earth. They're not even written as deliberately malicious creatures, more simple-minded and hunger-driven. William even offers that they just let Bilbo go since they're full. Gandalf of course comes back in time to pull the party out of the literal and figurative fire. I want to spend some time reflecting on Gandalf here. He's not of the races of Middle Earth, but instead of the Istar. His power comes as much from knowledge and experience as it does from the magic he wields. His importance is not as a wielder of powerful arcane magics, but instead as a shepherd and a catalyst for events in Middle Earth. When you think about it, on its own the plight of 13 itinerant dwarfs is unfortunate, but not something say on the scale of seeing the destruction of a magic ring holding the soul of the Dark Lord. He travels the world as an old wanderer, a teller of stories, and a purveyor of fireworks. But something about these dwarfs fit into a greater scheme, one that he may be working to shape, or one that may be beyond even his ken. Where I think Gandalf's personality really shines through is as a trickster. As far as tricksters go, he's rather tame and quite benevolent, certainly no Coyote or Anansi. When he first stops in on Bilbo his mind is not settled on his choice of a Burglar. Instead he finds the whole thing a source of amusement, shaking up Bilbo's life, the confusion of both Bilbo and the dwarfs, laughing at the pile of dwarfs who have fallen into Bilbo's doorway. Even how he resolves confrontations indicates a preference for trickery. A wizard who takes on a Balrog and investigates the dungeons of the Necromancer, can certainly handle three trolls. But he chooses to toy with them until the sun rises. His relationship with the hobbits is certainly one of both fondness and mischief, for he delights in shaking up the lives of these creatures of comfort to the dismay of respectable hobbits everywhere. "A wizard is never late, nor is he early, he arrives precisely when he means to."